Doctor Psycho is a fictional character appearing in DC Comics publications and related media. Traditionally presented as an adversary of Wonder Woman, he was first introduced to comics readers in the 1940s by Wonder Woman creator William Moulton Marston. He has since undergone several minor updates over the years as comics continuities have shifted and evolved. In his original appearances, Doctor Psycho demonstrated a command over the occult and was able to harness supernatural energies. Since 1987, he has been presented as a powerful telepath. Despite these changes, Doctor Psycho has consistently been portrayed as suffering from mental illness (ranging from mild obsessiveness to full-blown insanity), possessing a diminutive stature, and harboring a misogynistic hatred of women. The character of Doctor Psycho was created by William Moulton Marston, creator of Wonder Woman and author of her original adventures, and drew upon his interest in metaphysics and spiritualism. Marston, a psychologist, created Doctor Psycho as a murderous psychopath with an intense hatred of women. The character was partly inspired by actor Lon Chaney ("Man of a thousand faces") and partly by Marston's undergraduate advisor Hugo Münsterberg, who was opposed to women's suffrage and feminism, and was into metaphysics. Doctor Psycho was also one of several villains created for Wonder Woman who were occultists, beguiling the masses for their own self-enriching purposes. As Wonder Woman's rogues and supporting cast were largely jettisoned during the period that Robert Kanigher wrote and edited the issues, Doctor Psycho remained one of the few villains to appear in the Golden, Silver, and Bronze Age adventures. The character was also one of the few such villains to be modernized in the early issues of the post-Crisis on Infinite Earths issues. Doctor Psycho first appears as a pawn of the Duke of Deception. The God of War, enraged that women were gaining power in Earth society and potentially threatening his ability to engulf the world in war, ordered Deception to discredit women. Deception called upon Doctor Psycho to set about eliminating women from the war effort. Doctor Psycho was revealed in flashback to have been a medical student who was frequently humiliated by his peers. He discovered that his fiancee Marva Jane Gray was in love with college athletic champion Ben Bradley. Bradley removed him as a rival for Marva's affections by stealing $125,000 worth of radium from the college lab and hunching down in disguise so that Marva would think she saw her diminutive fiance as the culprit. Convicted on the basis of Marva's testimony, Psycho seethed behind bars for years, planning his revenge while developing an intense hatred of all women. Upon his release, he tortured and killed Bradley, who falsely confessed that Marva was his willing accomplice. Psycho then kidnapped and tortured Marva, hypnotically compelling her to marry him, and then subjecting her to daily occult experiments. Learning that he could use Marva as a medium for summoning ectoplasm he could use at will to fashion and animate human forms around his own misshapen body, he created a new career for himself as an occultist and sham psychic who developed a following of millions. At Deception's urging, he used his fame as an occultist to campaign for eliminating women from the war effort by creating an ectoplasmic form purporting to be the spirit of George Washington, claiming that women were hindering the war effort. He also disguised himself as Colonel Darnell of Military Intelligence to frame female staff of military intelligence for espionage. With the aid of Steve Trevor and the Holliday College girls, Wonder Woman disrupted his plot but was forced to let him go, unable to prove any of his crimes in a court of law. Doctor Psycho fixated his pathological hatred of women into fantasies of revenge against Wonder Woman. Freed from Psycho's influence, Marva joined the WAACs and helped Wonder Woman expose Nazi saboteur Stoffer, who had disguised himself as General Scott. Psycho was eventually imprisoned but escaped by faking his own death, kidnapping Marva and then his former secretary, Joan White, to use as mediums for his ectoplasmic power. He attempted to court Etta Candy in a disguise, but his cover was blown by Etta's suitor Oscar Sweetgulper and he was returned to prison. In the Golden Age, Psycho's brother Ironsides was a brilliant geologist who was also a villain. Ironsides invented the Iron Giant's disguise. He did not, however, display any superpowers. Psycho eventually realized that he could use Steve Trevor as a medium. Kidnapping Trevor, he fashioned an ectoplasmic dream of power from Trevor's unconscious mind and became the powerful Captain Wonder, who teamed up with the Silver Swan to destroy Wonder Woman. His powerful form was destroyed when Trevor awakened from his slumber. When the Monitor was testing heroes and villains in the run-up to the Crisis on Infinite Earths, he set up Doctor Psycho to retrieve ectoplasmic machinery from military intelligence and to fight with several of Wonder Woman's other rogues, but they were defeated by the combined might of Wonder Woman and Etta Candy, who used the ectoplasm machine to create a superpowered version of herself patterned after Wonder Woman. He is a telepath with the ability to enter and sometimes shape other people's dreams. Psycho was enlisted by Circe to create disturbing dreams for Wonder Woman's close friend, Vanessa Kapatelis, with the result that Wonder Woman would be forced to separate herself from her closest allies. This was part of a plot intended to leave Wonder Woman isolated and create widespread public fear of her fellow Amazons. Psycho later helps warp Kapatelis' damaged psyche to turn her into the new Silver Swan. Dr. Psycho's plans are foiled and he subsequently spends some time as a patient in a mental facility, confined to a padded room and a straitjacket. Several members of the time-lost Legion of Super-Heroes were in telepathic range. When Saturn Girl mentally shouts for a lost member, this awakened Dr. Psycho enough for him to attack several staff members and flee. The call brought him to the Legion, whom he also attacks. In the Villains United miniseries leading up to Infinite Crisis, Psycho has surfaced as a core member of Lex Luthor's Secret Society of Super Villains. Working with Talia al Ghul, he recruits many supervillains for the Society, and is rejected and successfully rebuffed by Catman. He threatens to have Catman kill himself. The presence of the man's loyal pack of lions convinces Psycho that he might be eaten if he forces Catman to harm himself. This rejection angers him, causing much grumbling for some time afterwards. He also spends time working with Deathstroke in order to capture one of the Marvel Family. Other members of the Society realize that Psycho is trying to mentally influence them. Unaffected, they brush it off as something to be expected. After the events of the 6th issue of Infinite Crisis, Psycho travels with Warp to free Doomsday from captivity near the center of the Earth. He takes control of Doomsday, and uses him to spearhead a supervillain assault on Metropolis. The villains lose this battle. One Year Later, Doctor Psycho is arrested and put on trial with Kate Spencer (Manhunter) as his defense attorney. Following his arrest, he is abandoned by the Society. During the trial, he uses his mind-controlling abilities to make Spencer dream of herself dressed as Wonder Woman in a scene reminiscent of the Roman Colosseum. Before the trial verdict could be revealed, his powers are returned to him as a result of his ties to the Society who had constructed the machine that was blocking them. He uses his telepathy to hold the people in the courtroom hostage. This forces Spencer to try to put on her uniform but she instead reveals herself to Doctor Psycho as Manhunter. Psycho then makes Kate put on her suit, but drops his guard to sneak a kiss with her, resulting in him being stabbed in the stomach and head. This causes him to forget about Kate's alter-ego and lose his powers. Doctor Psycho has lately been shown still in a position of authority with the Society in the Secret Six miniseries. He has been working with former enemy Cheshire for Vandal Savage and hiring various villains to put out hits on other Secret Six members. In the final issue of Secret Six (December 2006), he is stabbed repeatedly and seriously injured by the Mad Hatter. He resurfaced with his powers restored and amplified by Circe in the Wonder Woman series beginning in 2006. He was assisting Cheetah and Giganta. On the cover of Justice League of America (vol. 2) #13, it shows Doctor Psycho as a member of the latest Injustice League. During the Final Crisis storyline, Genocide was sent to the DMA (Department of Metahuman Affairs) Headquarters to retrieve Doctor Psycho, who is held captive there. In September 2011, The New 52 rebooted DC's continuity. In this new timeline, Doctor Psycho first appears in Superboy; a conman psychic who practices seance, using his telepathy to steal identities of customers in Manhattan. The purpose of this guise is to hide from the H.I.V.E., who are hunting those with telepathic abilities. He first encounters Superboy after hearing about aliens in the city. His astral form is unintentionally pulled into Superboy's mind, who is fighting Plasmus. After learning of Superboy's origin, which remains unknown to Superboy, he attempts to befriend him. The two are attacked by agents of H.I.V.E, which they defeat. They form an alliance against the organization. During their investigation, they run into a girl with psionic powers named Sarah, her powers manifest into a being called Decay; she had been previously experimented on by the H.I.V.E. He later appears in Teen Titans vol. 2 #11, where he is on the Metropolis prison talking with Psimon. Then he appears in Teen Titans vol. 2 #13, where he is trying to get Raven's powers, but he accidentally looks into her mind, where he sees her killing him. Later during the "Trinity War" storyline, Question gives Superman a newspaper clipping stating that Doctor Psycho was sighted in Khandaq the day when Doctor Light was killed. This causes Superman, Question, and the Justice League to go after Doctor Psycho. Superman, Question, and the others arrive in Pittsburgh to confront Doctor Psycho. Martian Manhunter looks into Doctor Psycho's mind and learns that he was sent to Kahndaq by the Secret Society, but did not do anything to control Superman's mind. During the "Forever Evil" storyline, Doctor Psycho is among the villains recruited by the Crime Syndicate to join the Secret Society of Super Villains. Then he appears in Justice League vol. 2 #29, where he is sent by the Society, along with the Fearsome Five and Hector Hammond, to fight against Cyborg and the Metal Men. He ends up being defeated by Gold. After the events of DC Rebirth, Doctor Psycho's history had been altered. Using his illusions to pose as a scientist for A.R.G.U.S. named Dr. Edward Carne, Doctor Psycho was first seen after Vanessa Kapatelis was defeated and brought into custody by Wonder Woman. As Doctor Carne, Psycho told Wonder Woman that when Vanessa woke from her comatose state that he would be there for her. Later, Doctor Psycho was one of several powerful psychics kidnapped by Amanda Waller to hack into Brainiac's mind. In the Watchmen sequel Doomsday Clock, Doctor Psycho is among the villains that attend an underground meeting held by the Riddler, where they talk about the Superman Theory. Psycho is a skilled occultist, and uses psionic powers to traumatize and terrify those who stand in his way. In his Pre-Crisis appearances, he was a hypnotist skilled in the occult who used his victims to draw ectoplasm ectoplasm into the physical world, which he shaped into various beings and disguises. In The New 52 continuity, Doctor Psycho possesses psychic abilities including the regular telepathy, mind control, astral projection, telekinesis, levitation, projecting destructive blasts of psionic energy and creating psionic energy constructs such as armor, although Edgar has stated that he possesses every psionic power imaginable. However, he does not have the energy required to use his abilities to their fullest. He can overcome this weakness by siphoning mental energies from other individuals with psionic powers such as Superboy. Doctor Psycho appears in the second story from Wonder Woman '77, a series based on the Wonder Woman TV series, though he did not have any appearances in that television series. The doctor escapes a mental institution and abducts Wonder Woman. Using his telepathic machines, Doctor Psycho convinces Diana that she is no longer Wonder Woman. The super heroine escapes his mental labyrinth and defeats Doctor Psycho and his illusions, returning him to the mental institution. 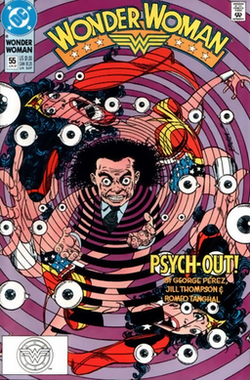 Doctor Psycho appears as a primary antagonist in the second volume of Wonder Woman: Earth One by writer Grant Morrison and artist Yanick Paquette. This version of the character is Dr. Leon Zeiko, a pick-up artist who manipulates Wonder Woman. "Doctor Psycho" is the title of the fourth episode of the fourth season of the TV series Orange is the New Black. Two characters exchange dialogue about Wonder Woman, and one of the characters later refers to another as Doctor Psycho, to which the other replies, "the one who hates women!" Doctor Psycho appears in Powerless episode "Emergency Punch-Up". In the show, he appears as a subject of a documentary about supervillains. Later on, a reporter tells the story that Doctor Psycho has released a dangerous gas which causes Wayne Security to go on lockdown until the all clear can be given. Doctor Psycho will be a regular character in the upcoming animated series Harley Quinn from DC Universe, voiced by Tony Hale. According to the character description, he is "an angry misogynist dwarf with telekinesis" rejected by even the other villains after calling Wonder Woman "a C-word". Psycho, years later, reluctantly joins forces with Harley Quinn in order to get back into the world of supervillains. Doctor Psycho appears in DC Universe Online. He is seen as a member of the Secret Society of Super Villains and is shown running an experimental facility within Metropolis General Hospital funded by LexCorp. He had also used Kryptonite to capture Supergirl in order to study her DNA for Lex Luthor. The players defeat Doctor Psycho and free Supergirl. In the villain campaign, the players help Doctor Psycho capture Supergirl. In Scribblenauts Unmasked: A DC Comics Adventure, Doctor Psycho is one of the thousands of characters that can be summoned by the player. Doctor Psycho appears in a flashback of Teen Titans Go! #54. Doctor Psycho appeared in the All-New Batman: The Brave and the Bold comic book series (which is based on the animated series of the same name). He was seen with the other Wonder Woman villains (consisting of Amoeba Man, Angle Man, Blue Snowman, Cheetah, Crimson Centipede, Fireworks Man, Giganta, Mouse Man, and Paper-Man) as they, along with an assortment of Batman's villains, crashed the wedding between Batman and Wonder Woman. They were swiftly defeated by the joint efforts of the Justice League and the Amazons of Themyscira. Doctor Psycho battles Wonder Woman in Dr. Psycho's Circus of Crime by Paul Kupperberg published by Capstone as part of their DC Super Heroes line of illustrated children's books. ^ a b c d Beatty, Scott (2008). "Doctor Psycho". In Dougall, Alastair (ed.). The DC Comics Encyclopedia. New York: Dorling Kindersley. p. 106. ISBN 978-0-7566-4119-1. OCLC 213309017. ^ Lepore, Jill (2014). "The Last Amazon". The New Yorker. ^ "Dr. Psycho's Circus of Crime". Capstone. Beatty, Scott (2009). Wonder Woman: The Ultimate Guide to the Amazon Princess. Dorling Kindersley Publishing. p. 95. ISBN 0-7894-9616-X. Jett, Brett. "Who Is Wonder Woman?--Bonus PDF"," (2009): "The Villains: Major Allegories", pp 5–6.